The Research Support Team at Liverpool John Moores University (LJMU) runs events called research cafés throughout the academic year. During these cafés, we bring together PhD students, early career researchers and more established academics over lunch to give them an opportunity to talk about their work to a lay audience of their peers and the public. From its inception in 2013 we have maintained the overall format of the research café, based as it is on promoting interdisciplinary dialogue in an informal setting, while also making a few small but significant changes. These changes have in turn increased the visibility and reach of research promotion within the Library. 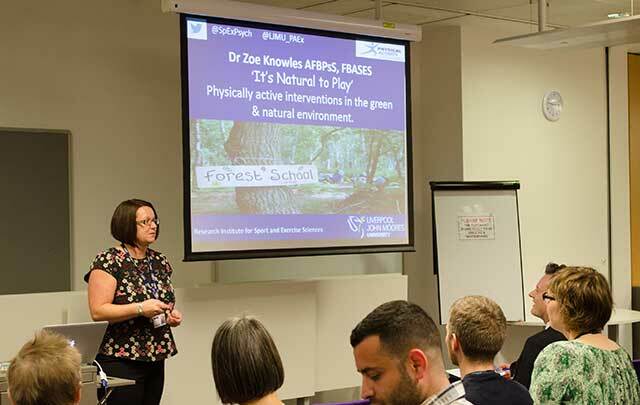 Against that backdrop, this article – which is based on a lightning talk and poster session presented at the 41st UKSG Annual Conference, Glasgow, in April 2018 – will outline why the library is ideally placed to facilitate this type of scholarship sharing and why research and community engagement should be viewed as an integral part of a university library’s agenda. It will also discuss how its success has allowed our Team to work in partnership with colleagues from across the University in new and exciting ways. Finally, it will address what further developments we can make to continue to improve and help the research community at LJMU and beyond. This sits well within the Library’s own Strategic Plans for 2017–2022 to collaborate with colleagues across the University and to help researchers disseminate knowledge. Alongside this, the library service also wants to impact on social change by ‘connecting people within the university and the community’ by ‘facilitating a programme of community-based events and other initiatives’. For these reasons, research events hosted by the Library can meet the strategic aims of both the Library and the University. Research funders increasingly expect – and in many instances formally stipulate – that research findings should not simply be disseminated to academic and policy audiences via, say, high-ranking peer-reviewed journals, but rather, researchers need to make sure that their work is communicated to and understood by the wider public.5 In that sense, research cafés are a platform by means of which researchers can ‘increase the accessibility of these more complex discourses’.6 Care must be exercised in respect of the idea that public engagement might be only viewed as ‘one way’ or for the purpose of educating an ‘ignorant public’.7 Public engagement, such as that made possible by research cafés, could perhaps been seen more widely as what Grand et al.8 referred to as ‘engaged research’, whereby it is ‘meaningful and relevant’ for both researchers and the public. Much in the way that open access has been a part of the ‘open research’ agenda for a number of years, we need also to think about how we can embed the transmission of research to the wider public and encourage researchers to ‘value the processes of engaged research and create a culture of reflective practice and mutual respect’.9 In addition to the goals of the University and the library service, researchers more generally see events that constitute ‘engagement’ as important to the research process. In Davies’ 201310 study of researchers’ thoughts on engagement they ‘viewed [it] as integral to an (implicit) contract between research and society’, and research cafés themselves present a simple way to enable this to happen. The café format is also an easy way for PhD students to get involved. Davies’ 200811 survey found that only 53% of PhD students had taken part in community engagement, the least involved cohort of those that responded. However, not everyone might view community engagement as a benevolent means by which to talk about and share their work. Davies’ 2008 study12 also found that researchers commented on the ‘publish or perish’ problem: increasing pressure to publish meant there simply was not time to participate. In addition, researchers commented on the absence of support from the University, either in the form of staff on permanent contracts who could assist long term or those that had the ability and wherewithal to assist with planning and logistics. Another study by Watermeyer and Lewis13 commented on the connection between the Research Excellence Framework (REF) and community engagement, the tacit understanding being that they probably should take part in it but lacked the opportunity and support to enable them to do so. Bauer and Jensen14 felt that this pressure to participate because of the REF could undermine participation and move involvement from one of personal development and an ‘intrinsic motivation’ towards ‘institutional incentives’ and thus this ‘changes the game’. Moreover, given its connectedness to the REF, the University and community engagement more generally, Reimer-Kirkham and Jule15 quite rightly question who determines if an event has gone ‘well’ or if people are ‘engaged’. The determinants of success can vary widely and could be based on the numbers that attended, the feedback from participants and attendees, inclusion in a REF case study or just the fact of sharing research more widely. At their inception, research cafés were held in the Library for an internal University audience. Three speakers from across LJMU’s then four faculties spoke for around 25 minutes on a Wednesday afternoon when there was no teaching. Tea and cakes were provided and often the lectures were taped and put on the LJMU YouTube channel,16 and a blog post17 explaining each event was put on our Library site. Initially, they were jointly run with LJMU’s Research and Innovation Support (RIS), whereby they would organize the speakers and presentations and the Library would organize the catering and locations. In late summer 2015 a new Research Support Team was created and, as a part of that, the creation of my role of part-time Research Support Librarian. It was at this point that we had discussed making some changes, for example moving our talks to over lunchtime, having one per faculty, and having some out in University buildings rather than just the Library. Just before our Christmas café in December 2015, our co-organizers in RIS both left and the organizing of the cafés fell solely to the Library. For this reason, the format for the cafés started in earnest in the 2016–2017 academic year, when we could plan for an entire year’s worth of events. Beyond the consideration that we hope to hold one research café for each of LJMU’s now five faculties plus one larger, multi-faculty holiday-time event, the boundaries and expectations are somewhat loose. We now no longer film events, nor do we do a post-event blog. This decision was made for both practical and logistical reasons. Practically, being a small team and the Research Support Librarian role being part-time, it was difficult to find the time for these tasks. Logistically, we noticed that it was easier to get people to come along and speak without the added pressure of being filmed. For each café we still aim to get three speakers, a combination of PhD candidates, early career researchers and a more established academic and lecturer from the same faculty, although this is not always the case. We invite speakers for many different reasons: they might have been recommended by others, suggested by the doctoral academy, or be in the wider university news arena; their names could have been seen in our academic repository or, occasionally, listed on some part of the LJMU website. There are times when people offer their services but, typically, they will be invited to speak. The logistics of our invitation often prove to be a unique selling point, with factors such as the date and time of the café, the nature of the presentation and the required and overall time investment being relatively convenient compared to other commitments. We still hold these events on Wednesday afternoons when there is no teaching, to encourage attendance but also to make it more likely that speakers will be available. Our cafés are generally from 12.30pm–2.00pm, over lunch, and we provide a University-catered packed lunch with tea and coffee. For the talks themselves, accessibility is key. We explain to speakers that they have approximately 15–20 minutes to speak, along with questions at the end. Regarding the talk content, we also explain that they should presume that the audience might know little about their work and/or their subject area and thus they need to pitch their talk appropriately. Their café talks are intended to provide a window to their work. For those in the audience, this may mean different things: the speaker may be seen as a potential collaborator or may enable them to put a name to a face, or the audience members may just have come to enjoy an interesting lunchtime talk – maybe sometimes all three! Similarly, the audience is not expecting to hear a fully-formed thesis, nor will they be looking for a loophole in which to catch the speaker out, though the intention is that they should not be left to be completely confused either. Most presenters have PowerPoint slides but this is not a requirement. They are generally asked for a short biography and their presentation a week in advance, although they tend to be received a day or two beforehand. For each café, we try to have at least two members of Library staff attend to organize, and normally this will be two people from our three-member Research Support Team. This allows one of us to speak to presenters, get their presentations ready, rearrange chairs and sort out lunches. During the talks themselves, one of us does the introductions and makes sure there is at least one question asked, while the other person tweets. This year we have also had the manager of our Research Support Team speak briefly about research data management to promote our new data repository but also to advocate for how the library can potentially help them. All of our events are open to all University staff and the wider public and we use Eventbrite to provide a place for people to sign up. Events are publicized via University sites, our research support web page/calendar, tweeting and mentioning at most things we attend. We also get our Academic Liaison Librarian colleagues to promote the events and do a call for speakers at various points in the year. The contacts and collaborations that we have developed over the past three years have exceeded the expectations that we had originally outlined. 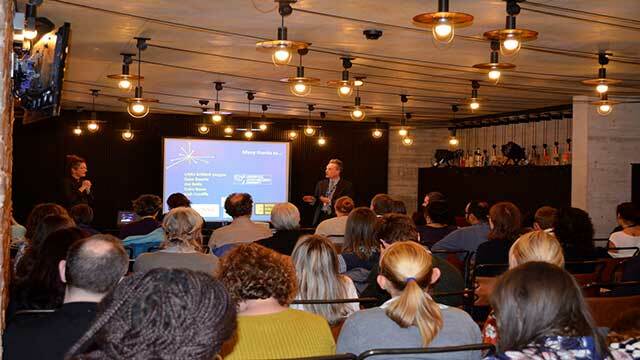 This year we held seven research café events, in six different locations, with a total of 20 speakers and 183 attendees. In that sense, we have taken the Library out to a much wider audience both inside and outside the University, into Liverpool, and have brought together a diverse audience of people and research. After each event we always reach out to the speakers to thank them for taking part, and the response has been overwhelmingly positive. For most, it was a chance to think about and share what they have learned in their own research. One participant said, ‘I am quite passionate about my research area and it was great to share what I have learnt’. Others commented on the opportunity to listen to other researchers, with one saying, ‘It is also really beneficial to listen to other researchers because it helps develop a perspective on one’s own study’. The public nature of research cafés – moving research outside of the department – has also been mentioned by one speaker, who added, ‘I find the process of putting new ideas and “revelations” into a public space extremely cathartic’. Still, there is much work to do to increase our public and community engagement. We hope to increase the number of members of the public attending as well as running more events beyond University spaces, possibly with cultural and other university partners in Liverpool. We would like to do a joint café with our collaborators at the University of Liverpool that might potentially develop into a larger event. There is plenty of scope for more events based on themes or specific research areas, and these are limited only by the capacity of our small team and the willingness of other partners to collaborate. Since the reformatted research cafés began in the 2016–2017 academic year, we have been able to take part in a number of additional activities due to increased awareness of the Library’s role. For example, we have been invited to external events, like LJMU’s Research Day, the Doctoral Academy’s annual conference, the Public Health Institute’s PhD Symposium and the Institute for Health Research conference. This involvement was largely down to our increased profile; meeting/inviting different researchers from across each of the University’s five faculties inevitably means that our team is introduced to lots of different people, who are involved in myriad events and research areas. This has been a slow process but, especially this year, we have sensed a bit of momentum, with more people wanting to get involved and having heard of what we do. A result of running the cafés is that we have helped facilitate three bespoke café events. 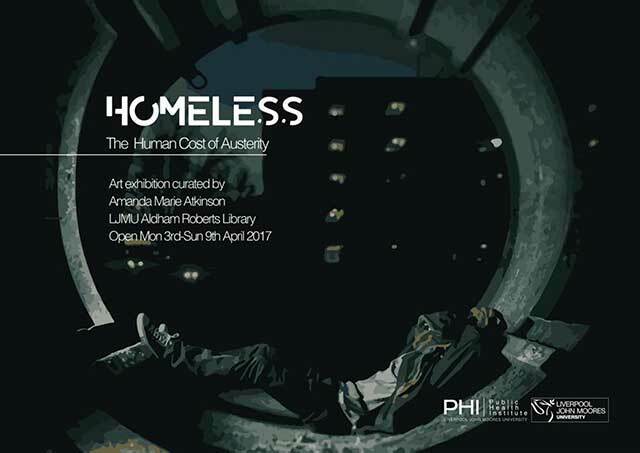 In March 2017 we helped to organize an art exhibit/research event with Dr Amanda Atkinson from our Public Health Institute, entitled ‘Homeless: the human cost of austerity’. Dr Atkinson curated the event, which was an art exhibition as well as a launch with presentations from researchers and practitioners working with homeless organizations in Merseyside. In January 2018 we held a systematic review research café, where three researchers talked about their experience of working in this area of research. Finally, in September 2018, we are holding a Drone Research Engagement Day after being asked by Dr Claire Burke, a speaker at our Faculty of Science research café 2018, if we would be interested in facilitating an event that could bring together people from across Liverpool who work with drones. Research cafés facilitate an interesting intersection of people, community and research, where the goal is to share what we have learned. I do not suggest that the Library is an entirely neutral space – rather that, because we do not necessarily have a direct agenda with the REF, departments, or individual faculties, we can provide an opportunity to practise, learn and share without perceived strings attached. We want to hear about and help promote work, enable people to share ideas and give people opportunities to discuss what they are doing with a wider audience. The Library is unique in the sense that it has space and is open 24 hours, day and night, and has support from staff to help facilitate events, provide IT assistance and occasionally has a small budget with which to put these things on (whereas most individual staff members and PhD students do not). As long as the Library is willing to bring together people and research, we hope that there is an audience and appetite to share, learn and discover together via research cafés. Cafe Scientifique: http://www.cafescientifique.org/ (accessed 9 July 2018). Davies S R, Research staff and public engagement: a UK Study, Higher Education, 2013, 66, 725–739; DOI: https://doi.org/10.1007/s10734-013-9631-y (accessed 9 July 2918). Cohen J and MacFarlane H, Beer and Bosons at the Café Scientifique, Museums and Social Issues, 2007, 2(2), 233–242; DOI: https://doi.org/10.1179/msi.2007.2.2.233 (accessed 9 July 2918). Strategic Plan Liverpool John Moores University 2017–2022: https://www.ljmu.ac.uk/~/media/files/ljmu/public-information-documents/strategic-plan/strategic-plan-2017-2022.pdf?la=en (accessed 9 July 2018). Cohen J and MacFarlane H, ref. 3. Davies S R, Constructing Communication: Talking to Scientists About Talking to the Public, Science Communication, 2008, 29(4), 413–434; DOI: https://doi.org/10.1177/1075547008316222 (accessed 9 July 2018). Davies S R, ref. 6. Grand A, Davies G, Holliman R and Adams A, Mapping Public Engagement with Research in a UK University, PLOS ONE, 2015, 10(4), 1–19; DOI: https://doi.org/10.1371/journal.pone.0121874 (accessed 9 July 2018). Grand A, Davies G, Holliman R and Adams A, ref. 8. Davies S R, ref. 2. Watermeyer R and Lewis J, Institutionalizing public engagement through research in UK universities: Perceptions, predictions and paradoxes concerning the state of the art, Studies in Higher Education; DOI: https://doi.org/10.1080/03075079.2016.1272566 (accessed 9 July 2018). Bauer M W and Jensen P, The mobilization of scientists for public engagement, Public Understanding of Science, 20(1), 3–11; DOI: https://doi.org/10.1177/0963662510394457 (accessed 9 July 2018). Reimer-Kirkham S and Jule A, Crosstalk: Public Cafés as Places for Knowledge Translation Concerning Health Care Research, Health Communication, 30(5), 496–503; DOI: https://doi.org/10.1080/10410236.2013.868398 (accessed 9 July 2018). LJMU Research Café: https://www.youtube.com/playlist?list=PLD_jFJJqLKxKvqu278STa81qZPcaXGmG6 (accessed 9 July 2018). Ljmulibrary, 3 August 2015, Liddell Hart, Paraguayidad and open-end winding drives at Research Café IX, LJMU Library: https://ljmulibrary.wordpress.com/2015/08/03/liddell-hart-paraguayidad-and-open-end-winding-drives-at-research-cafe-ix/ (accessed 9 July 2018).